An overjoyed mother believes that her son has risen from the dead. Cherris Maluleke (55) of Chiawelo, Soweto, says 22-year-old Debaba died after a car crash nearly four years ago. She says she never gave up hope of seeing Debaba again after his death and burial in 2011. 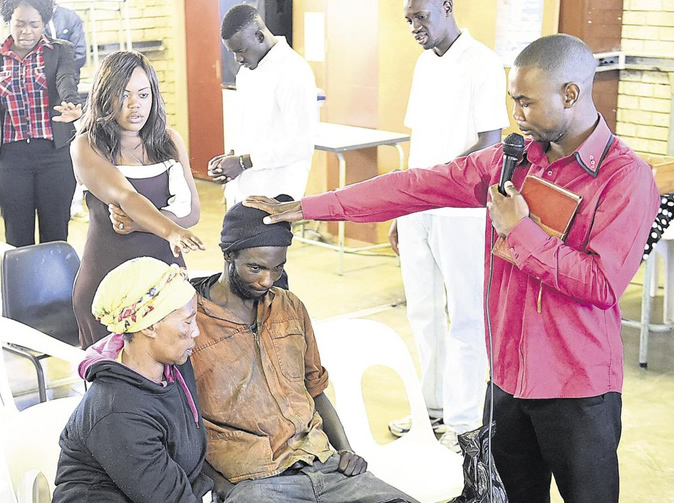 Cherris said her prayers were answered this Sunday when she found a man she believes is Debaba wandering in Johannesburg’s Braamfontein. Now he’s happily back home with his family in Chiawelo, she said. Debaba died in September 2011 after a terrible car crash. He was 18 years old. He was on his way to a big music festival in Giyani, Limpopo, when the car rolled and fell off a bridge. The family buried Debaba a week later. And then a few months later she started seeing him in her dreams, asking to come home as he was tired of wandering around. She went to herbalists and prophets that year and Cherris said they confirmed her suspicion that her son was still alive. One diviner took Debaba’s clothes to use to bring him back. “I left everything in God’s hands,” said Cherris. Nothing happened until last Wednesday, when Pastor Enoch Mashasule of the Gospel of Jesus Ministries in Chiawelo said special prayers for Debaba. Cherris fasted and prayed every night. “I prayed for my dead son to return to life,” she said. “And then this Sunday on my way to work I found him carrying a black plastic bag in Braamfontein. “I called his name – and he called my name. She said she also recognised her son by marks on his stomach and the back of his body. “I am so happy that God gave me my son back,” she said. Cherris took the young man at once to her church to be prayed for. Then she took him home for a warm bath and a hearty meal with his brothers and sisters! When the SunTeam questioned Debaba he could only nod or shake his head to signal yes or no. Cherris said she will take him for a DNA test to prove he really is her son, come back from the dead.